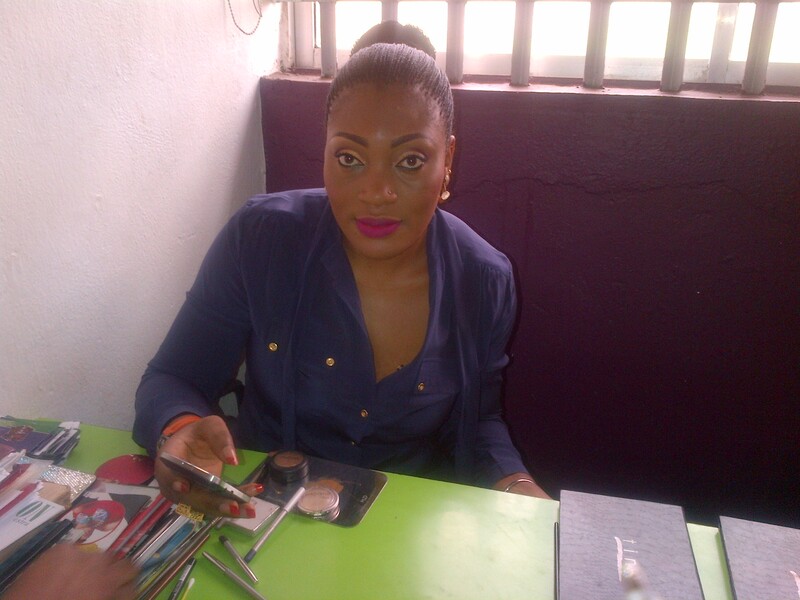 She Started with a brown powder and a “multi-purpose” lip gloss…. A brief Intro. Tell us about you. My name’s Esther Odey. I’m a make-up artist by profession but I like to call myself a beauty artist but the National name is Make-up artist when you get to paint faces. I’m a graduate of English and literary studies from the University of Abuja. 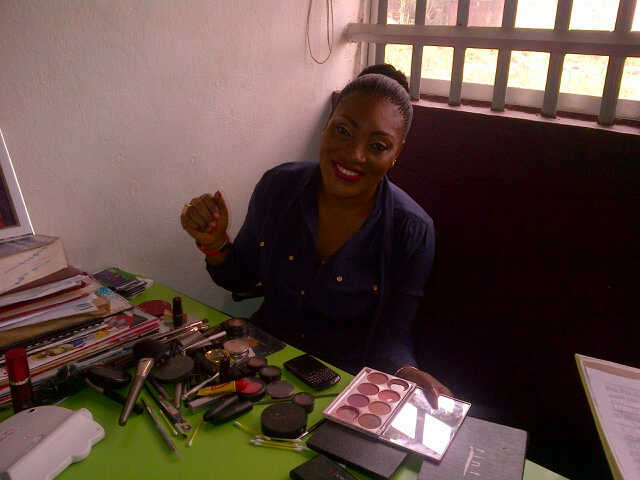 I live in calabar but I try to do make-up a lot outside Calabar so, I won’t call myself a Calabar make-up artist. I’m married with a son: (Little Larry, who was not missing in action during this interview session.) For me, it’s a lot of work. Work, work, work, so I try to have fun while I’m working so, that’s my social side. Sometimes when I go for weddings, I like to hang out with the bride during receptions, touch her up and make sure she’s still looking good. Or when I’m training my students, I also try to make it fun because I realized that they learn more when you’re playful. When it’s your passion, you don’t have to try so hard. Then weekends, I love to hang out with my family. Mostly my son because he’s a baby so, I try to play with him and take him out for ice-cream and when I’m working outside Calabar, he gets to go with me so I can have my eyes on him. Growing up; I was born in Ogoja then my family moved to Abuja. I did my secondary, diploma and university there. Then, I got married and moved back. So, I’m here now. So, you’re a make-up artist. For how long now? Any challenges? I’ve officially been practising since 2008 so that’s almost five years. Over the years, I’ve acquired FOUR (4) certificates in make-up artistry including air-brushing and I’m the only one that does air-brushing in South-South. I got trained by an American professional so, it’s an edge for me. Challenges, I won’t say I’ve met challenges. I’d just say I’ve met different people and had to bring out the best in their facial features. I love everything beauty I don’t reject any face because I think there’s beauty in everyone. all I try to do is diminish the flaws and highlight the best features. The best part for me is having happy brides and beautiful pictures of them. Horizon Inc. is really looking into the fashion culture in C.R.S, what’s your take? *hmmm* The Fashion culture in this state is fast-growing because of tourism. The girls are becoming really daring when it comes to clothes. It’s interesting to think that people are finding a lot of their fashion sides and expressing their personalities. I used to think there were a lot of local people here but over the years, people are becoming aware. It’s impressive. Beauty for me is make-up, clothes, hair and nobody is ugly when you put all that together. Colour blocking has taken over the day. But it’ll pass. It’s better to have classic pieces that are timeless than to colour-block and when it goes you’re stranded. I’d like to see more creativity. For me, I like to dress for comfort. I really wouldn’t want to pull up my bra or step down my heels while working. I’m bending most times so, I need to be comfortable. I always have to be comfortable. I like to dress up because pictures will be going around and I like to look good in pictures. As a well known entrepreneur, what are the extra efforts you put into stay on-top? For me, it’s about personality. I keep telling my students that. It’s your personality people come to patronize not basically your talent. What keeps my clients loyal to me is my personality. I try to be nice, there’s a friendly rapport and I try to do my best. And it’s all about diversity too. I do a lot of free make-up and photo shoot for models and I recently added the make-up girls’ school, I want to empower young girls in Cross River. So, the LaEstel Make-Up academy will be starting by third week of February. So, for me, it’s just the passion that works for me. What’s been your lowest point in the business so far? Lowest point for me will be when I don’t have a satisfied bride especially when I’m not the one doing the job. 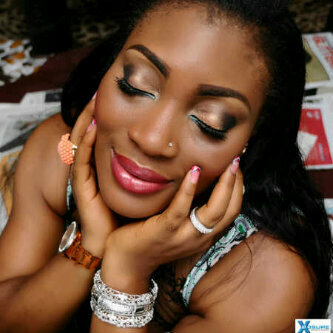 It’s always very heart-breaking when I can’t get to all my brides especially when I’m not in calabar. Most brides would rather have you doing it than some-one else. For me, I work on a “first come, first serve basis”. That would be winning the Tara award for “Most Valuable Rep.” And getting the certificate from Tara herself. It was really, really, nice. 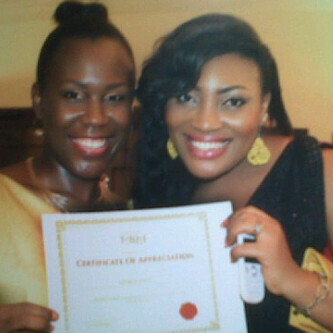 Another high point would be getting the “Mud Best Student” when we did the Mud Academy and on my last certificate, I was their best student and having to train people in Port-Harcourt is a high point for me because they have make-up artists there and yet I’m being chosen to train them. Another high point would be the one in Abuja in April where I’d be handling the training of women in Abuja. It’s really interesting for me. It just makes me happy. 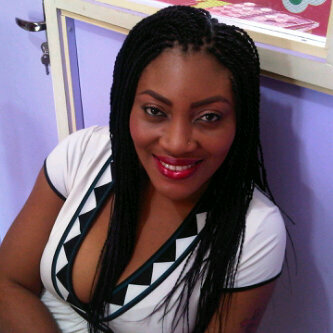 Being the make-up artist you are, was it always your dream? Or would you rather be doing something else? I won’t trade this for anything in the world. As a University student, I remember begging my dad to let me go to make-up school when Tara just launched in Lagos and my dad would say “No, you can’t be a painter and if you have to be, you have to go to school first.” But I remember I started using brown powder and lip gloss at the age of 13. I was in JSS3. The brown powder used to give me eczema, if I hug you with it, your entire shirt would scream. I had this lip gloss that had round balls too. I used to put it on my lips and eyes as eye-shadow, you know I was 13. It’s something that I was born with though my parents tried to stop me till I graduated. So I’m trying to make the university students to start now unlike me that had to wait. How’s business been so far? If I tell you how rich I am, I’d be lying because it’s not about the money. Money will come, but for me, it’s the passion. I feel privileged to have done so many brides within Cross River and beyond. I feel really gifted. What’s a typical “Esther” day like? Estel would be nice. I wake at 8am because I have to take my son to School. Estel’s day starts at about 8:30. I get here, pray, try to complete the previous day’s work and start on the new day’s work as well… work, work, work. I try to make time for my son a lot because I want to be a part of his life in every possible way. So that’s basically it. Tara! That’s why she gave me the award. I patronize her ‘cos she’s our own. I’m a very loyal Nigerian. Mud too. I’m the distributor of MUD in C.R.S. I’m not a big fan of Mac products but people like MAC. Perfect outfit would be … nice, modest, make it your own in any style at all and then, lock it with a smile. Expensive… in my wardrobe… My shoes, bags, my House of Dereon jeans, too. My Tissot wrist watch *flashes the wrist watch gaily*. It has an orange strap, there’s titanium somewhere, it just has many bits and it’s so cool. It was a reconciliation gift from my brother. Wow! I’m really happy that you thought of this kind of thing. It’s want I hope to be able to achieve; empowering young girls to be their own bosses. Like I said, by the time you girls are 30, you’d already be making a lot of money. It’s something young girls should take seriously. I want young people to get off BBs and make money to pay for it, even on BBs, you can make the BB to pay for itself. This is really impressive. Thanks for coming to chat with me today. *Thank you too, Estel. This interview session lasted almost an hour. Horizon Inc. would like to add to your awards. Yes! You won the award for “Most Interesting Interview session”.. Yay! 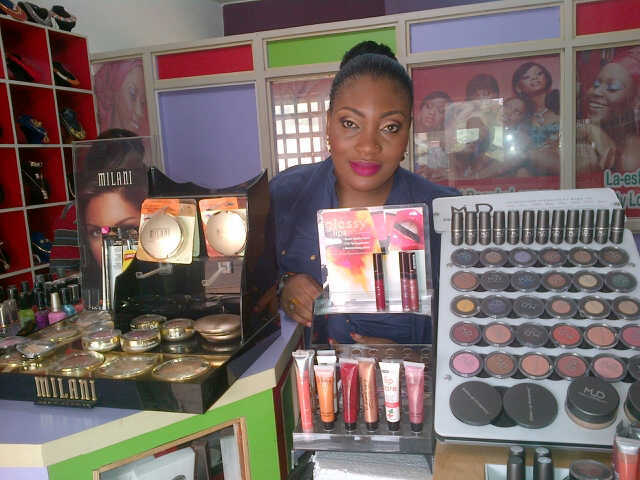 This entry was posted in Interviews and tagged adverts, Calabar, Color Block, Fashion., hobby, LaEstel Make-up, LaEstel Make-up Academy, make-up, passion, skills, success, women. Bookmark the permalink.